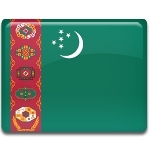 Day of Commemoration and National Mourning is annually observed in Turkmenistan on October 6. This is a public holiday, that is observed to commemorate the earthquake in 1948. The earthquake stroke and destroyed the largest city in Turkmenistan, Ashgabat. The earthquake stroke Turkmenistan at 2:17 in the morning on October 6, 1948. The epicenter of the earthquake at a magnitude 7.3 MMS was 25 km (15 mi) southwest of Ashgabat. Almost all brick buildings in Ashgabat collapses and concrete buildings were severely damaged. The city infrastructure was badly damaged. Number of causalities varied from 10,000 to 176,000. According to a news release in 1988, the correct death toll was 110,000 people, why authorities claim that is was 176,000. This earthquake was the deadliest in the history of Turkmenistan. 10% of population of Turkmenistan died in one day. People of Turkmenistan don't forget the earthquake and annual ceremony is held in Ashgabat. President of Turkmenistan and local authorities obligatory attend the ceremony, that is broadcast on public channels. National flag flies half-mast and public traffic is stopped on this day.